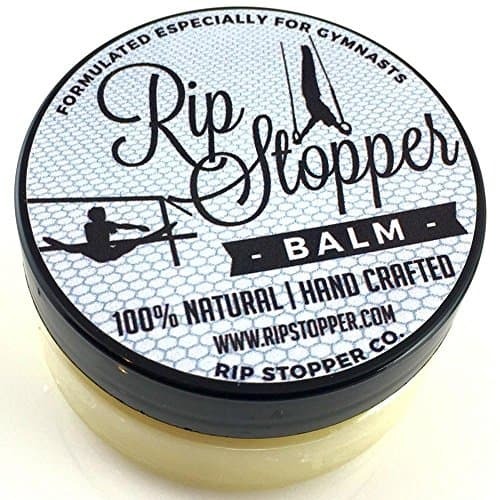 Designed especially for gymnasts and their hard working hands. Helps repair damaged skin and condition skin to prevent future rips/tears. Helps with rips from the bars, grips, rings and pommel horse. 100% natural blend of premium quality oils helps soothe and promotes healing your dry, damaged, cracked and ripped skin. Designed especially for gymnasts and their hard working hands. Each ingredient was hand selected to create the perfect formula to get your hands back to competition ready shape as quickly as possible. Nobody wants to lose training time so this balm keeps the skin on your palms supple and moisturized. It works in two ways: 1) Prevent and 2) Repair. Prevent – The balm helps to prevent rips by offering superior moisturizing power in addition to reducing swelling and promoting new skin cell growth. Repair – The balm helps soothe the pain of ripped skin, creates a protective barrier and promotes skin repair. You should always have a jar in your training bag. Palm Rips, Wrist Rips, Finger Rips, Foot Rips we have them all covered this balm works on any rip or blister prone area of skin. Also works great for Beam Burn or Mat Burn. Ingredients and Effects: Sweet Almond Oil: Relives itching, soreness, and dryness Jojoba Oil: Promotes new skin cell growth and is anti-bacterial Coconut Oil: Helps to retain skin moisture levels and softens skin Shea Butter: Reduces inflammation, skin moisturizing and smoothes skin Tea Tree Oil: Antiseptic, Anti-fungal, Anti-inflammatory, cleans wounds, and repairs skin Wheat Germ Oil: Heals dry damaged skin and reduces scaring Eucalyptus Oil: Analgesic, Anti-bacterial, Anti-viral, Anti-inflammatory Tamanu Oil: Reduce scaring, promotes new skin cell growth, anti-inflammatory, anti-bacterial Peppermint Oil: Anti-bacterial, analgesic, reduces itching, anti-microbial Myrrh Oil: Anti-Microbial, Anti-fungal, and Antiseptic Beeswax: Skin softener, anti-inflammatory, anti-bacterial and encourages wound healing.